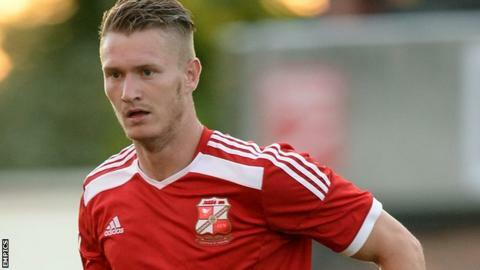 Michael Smith scored twice for Swindon before they held off a second-half fightback from Sheffield United to record a convincing victory. Smith put the hosts ahead and doubled their lead from the spot after Neill Collins felled Massimo Luongo. Jonathan Obika bagged a third soon after before Mark McNulty and Ben Davies looked to put United back in it. But Andy Williams slotted home and Louis Thompson struck from outside the area to seal an emphatic home win. Smith's brace takes his tally up to four goals this season, with his first coming after just 13 minutes courtesy of Thompson's through-ball. The win sees Swindon move up to fourth in League One with the Blades slipping to tenth. "We were poor defensively. We need some help in the centre-half department, which we have been talking about since Harry Maguire left. "Going forward, we scored two goals away from home. That should be enough to get you a point. "The 18 here today is the only 18 we've got fit." Match ends, Swindon Town 5, Sheffield United 2. Second Half ends, Swindon Town 5, Sheffield United 2. Substitution, Sheffield United. Robert Harris replaces Neill Collins. Corner, Sheffield United. Conceded by Jake Reeves. Goal! Swindon Town 5, Sheffield United 2. Louis Thompson (Swindon Town) right footed shot from the centre of the box to the top right corner. Assisted by Yaser Kasim. Corner, Swindon Town. Conceded by Craig Alcock. Attempt missed. Neill Collins (Sheffield United) header from the centre of the box is just a bit too high following a corner. Corner, Sheffield United. Conceded by Yaser Kasim. Goal! Swindon Town 4, Sheffield United 2. Andy Williams (Swindon Town) left footed shot from the centre of the box to the bottom right corner. Assisted by Louis Thompson. Substitution, Swindon Town. Josh Lelan replaces Raphael Rossi Branco because of an injury. Corner, Sheffield United. Conceded by Jordan Turnbull. Substitution, Swindon Town. Jake Reeves replaces Massimo Luongo. Goal! Swindon Town 3, Sheffield United 2. Ben Davies (Sheffield United) right footed shot from the right side of the box to the top left corner. Assisted by Ryan Flynn. Attempt missed. Michael Smith (Swindon Town) header from the centre of the box is close, but misses to the right following a corner. Corner, Swindon Town. Conceded by Mark Howard. Goal! Swindon Town 3, Sheffield United 1. Marc McNulty (Sheffield United) right footed shot from very close range to the bottom right corner. Assisted by Ben Davies. Goal! Swindon Town 3, Sheffield United 0. Jonathan Obika (Swindon Town) left footed shot from the centre of the box to the bottom right corner. Assisted by Brad Smith. Substitution, Sheffield United. Louis Reed replaces Chris Basham.